Our website is changing. The new site will be www.10thMass.com . We thank you for your patience as we make the move. Organized at Springfield June 21, 1861. Moved to Washington, D.C., July 25-28. Attached to Couch's Brigade, Division of the Potomac, to October, 1861. Couch's Brigade, Buell's (Keyes') Division, Army of the Potomac, to March, 1862. 1st Brigade, 1st Division, 4th Army Corps, Army of the Potomac, to September, 1862. 1st Brigade, 3rd Division, 6th Army Corps, to October, 1862. 2nd Brigade, 3rd Division, 6th Army Corps, to January, 1864. 4th Brigade, 2nd Division, 6th Army Corps, to July, 1864. 1862 Duty at Kalorama Heights and Camp Brightwood, Defenses of Washington, D.C., until March, 1862. March to Prospect Hill, Va., March 11-15. Embarked at Alexandria for the Peninsula, Virginia, March 25. Siege of Yorktown April 5-May 4. 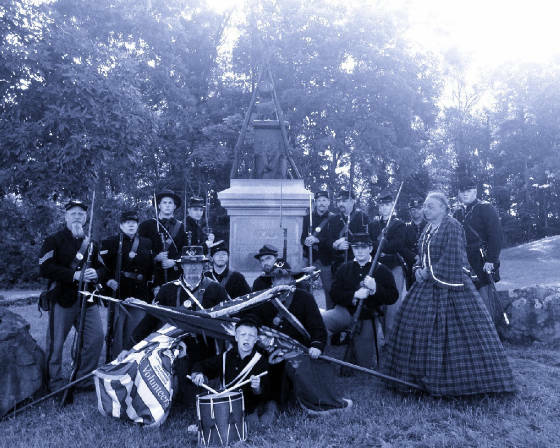 Battle of Fair Oaks, Seven Pines, May 31-June 1. Seven days before Richmond June 25-July 1. Oak Grove, near Seven Pines, June 25. White Oak Swamp June 30. Malvern Hill July 1. At Harrison's Landing until August 16. Reconnaissance to Turkey Island August 5-6, and to Haxall's Landing August 8-11. Movement to Alexandria August 16-September 1, thence march into Maryland September 3-18. Battle of Antietam September 18. At Downsville September 18-October 20. Movement to Stafford C. H. October 20-November 18, and to Belle Plains December 5. Battle of Fredericksburg, Va., December 12-15. "Mud March"
1863 January 20-24, 1863. Chancellorsville Campaign April 27-May 6. Operations at Franklin's Crossing April 29-May 2. Maryes Heights, Fredericksburg, May 3. Salem Heights May 3-4. Banks' Ford May 4. Franklin's Crossing June 6-7. Battle of Gettysburg, Pa., July 2-4. Bristoe Campaign October 9-22. Rappahannock Station November 7. Mine Run Campaign November 26-December 2. 1864 At Brandy Station until May 1, 1864. Reconnaissance to Madison C. H. February 27-March 2. Rapidan Campaign May-June. Battles of the Wilderness May 5-7. Spottsylvania May 8-12. Spottsylvania C. H. May 12-21. Assault on the Salient at Spottsylvania C. H. May 12. North Anna River May 23-26. Line of the Pamunkey June 26-28. Totopotomoy May 28-31. Cold Harbor June 1-12. Before Petersburg June 17-19. Ordered home for muster out June 19. Mustered out July 6, 1864. Regiment lost during service 10 Officers and 124 Enlisted men killed and mortally wounded and 1 Officer and 55 Enlisted men by disease. Total 190. A portion of the speech made by Ex-Governor George N. Briggs, father of Col Briggs as the Regiment prepared to leave for the war.